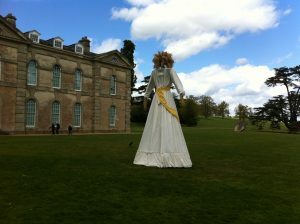 Compton Verney, where Faye has created a stunning 5-metre corn dolly “The Kern Baby” which can be seen in the Capability Brown grounds until December. Next May this will tour to the Library of Birmingham to link with the Benjamin Stone Collection that inspired Faye, alongside a larger exhibition of her photographs from Marton, prior to a high profile exhibition in London. Thanks to the Heritage Lottery Fund the photographs will also form part of Marton Museum’s permanent collection. A display at the Library of Birmingham currently tells Kern Baby’s story ahead of the sculpture touring there next year.